76 n Performance & Hotrod Business n April 2015 HOTROD II Dodge military vehicles. This is our mainstay, but we are certainly not limited and will consider restoring any vehicle or equipment brought to us." M Series Rebuild has mechanical work/ rebuilding and assembly going on in one large building. Another houses tear-down, fabrication, bodywork and paint. A paint booth is located in the same building, but is isolated from other work areas for clean- liness. Parts storage is in a sealed container, while painted items awaiting reassembly are stored in a separate dedicated con- tainer. Steam cleaning is typically done in designated outdoor areas. Talbert has four employees in the shop, plus office staffers who do various other things as well. Advertising & Promotion A typical 132-page issue of a niche magazine called Military Vehicles (www. 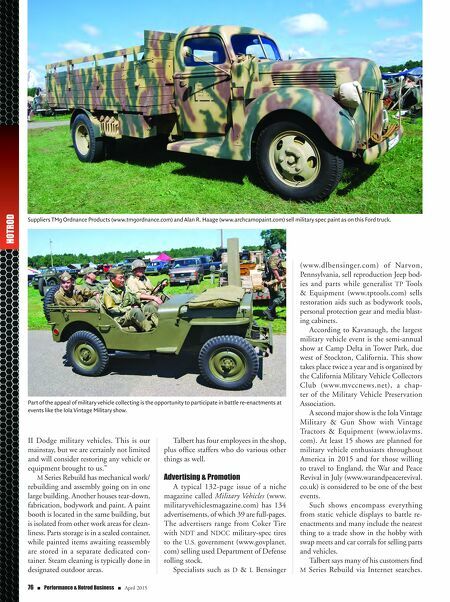 militaryvehiclesmagazine.com) has 134 advertisements, of which 39 are full-pages. The advertisers range from Coker Tire with NDT and NDCC military-spec tires to the U.S. government (www.govplanet. com) selling used Department of Defense rolling stock. Specialists such as D & L Bensinger Suppliers TM9 Ordnance Products (www.tm9ordnance.com) and Alan R. Haage (www.archcamopaint.com) sell military spec paint as on this Ford truck. (www.dlbensinger.com) of Narvon, Pennsylvania, sell reproduction Jeep bod- ies and parts while generalist TP Tools & Equipment (www.tptools.com) sells restoration aids such as bodywork tools, personal protection gear and media blast- ing cabinets. According to Kavanaugh, the largest military vehicle event is the semi-annual show at Camp Delta in Tower Park, due west of Stockton, California. This show takes place twice a year and is organized by the California Military Vehicle Collectors Club (www.mvccnews.net), a chap- ter of the Military Vehicle Preservation Association. A second major show is the Iola Vintage Military & Gun Show with Vintage Tractors & Equipment (www.iolavms. com). 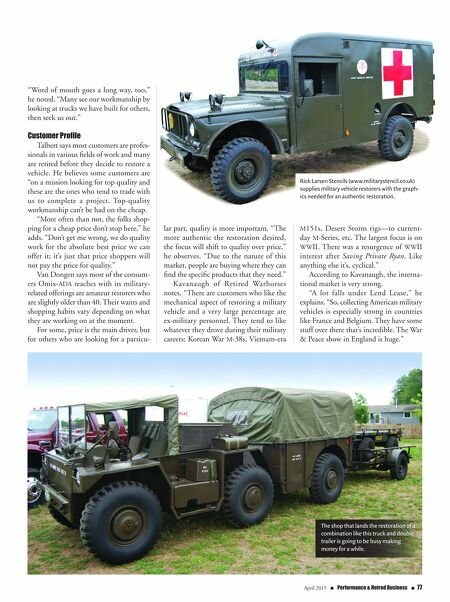 At least 15 shows are planned for military vehicle enthusiasts throughout America in 2015 and for those willing to travel to England, the War and Peace Revival in July (www.warandpeacerevival. co.uk) is considered to be one of the best events. Such shows encompass everything from static vehicle displays to battle re- enactments and many include the nearest thing to a trade show in the hobby with swap meets and car corrals for selling parts and vehicles. Talbert says many of his customers find M Series Rebuild via Internet searches. Part of the appeal of military vehicle collecting is the opportunity to participate in battle re-enactments at events like the Iola Vintage Military show.